I posted these nails on my instagram a little while ago but wanted to put out some extra photos because I really enjoyed how the gold dry-brush look came out. Essie's Be Cherry! 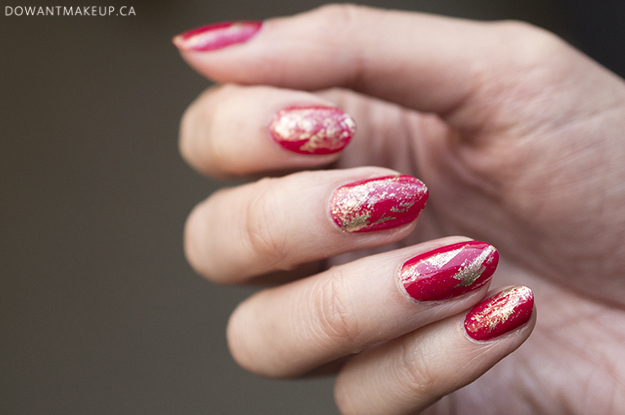 is such a lovely classic red polish--a perfect fit for the recent holiday collection. The formula is nice and forgiving, and the colour is almost a one-coater. 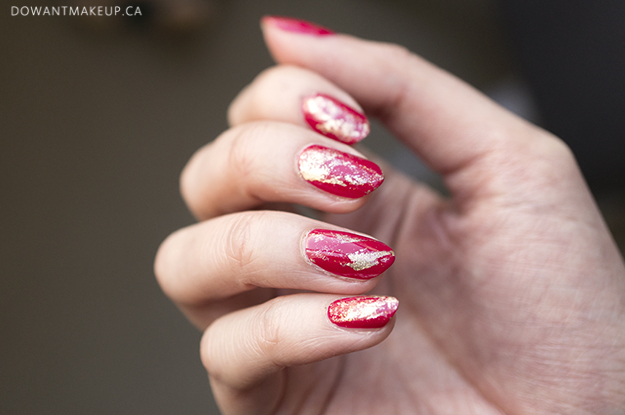 Orly Luxe is my absolute favourite gold foil polish and so reliable, smooth, and opaque for nail art. BUT, when I took it out of my drawer, I realized that the last time I used it, I didn't completely close it. That was probably a few months ago, and as soon as I felt the loose cap, I knew exactly what to expect. Dry, thick, gloopy gold foil polish :( Luckily, that's not such a bad thing for dry brushing, but I'll definitely need to pick up a replacement for future nail art. As a final touch, here and there I dabbed on a little OPI Goldeneye, a deep gold glitter. It doesn't show up very well in the photos, but it added a warmer gold sparkle for more dimension.